Slepalex - GeoControl's interface looks clean and nice big preview screen. The submenus layout look great; I'll check out the demo, thanks. Slepalex - So GeoControl is now World Creator, is that right? I found the GeoControl 30-Day Demo (http://www.cajomi.de/Download/GeoControl_Demo1.13a_Setup.exe). It gets tricky when trying to draw terrain larger than 1024 as my system slows down but it makes fantastic terrains. What was most surprising was that it exports PGM format and I was able to import it Bryce and can modify it in the Terrain Editor without any issues. Thanks again for the heads up. Eugenius - I have the GeoControl Demo version and could use it for 30 days. Then I puchased WorldCreator (version 1) and it looks and works the same as GeoControl, except that the GUI is a bit different. Compare with SlepAlexe's screenshot on the previous page. I do not recommend editing the height map in Bryce after downloading PGM. As soon as you do this, you will immediately get 8 bits instead of 16 bits of gray and you will observe steps on the landscape. 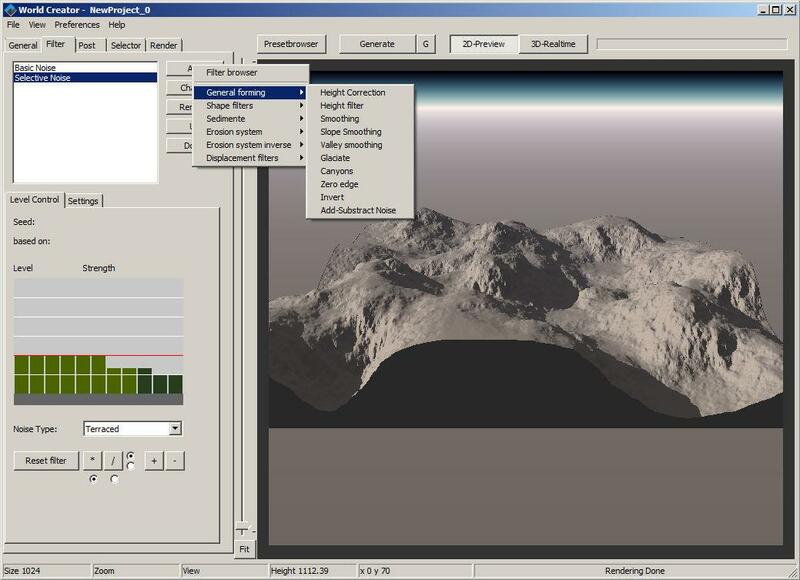 It’s better the other way around: first create a terrain in TE, then edit it in GeoControl. After that, in Bryce, you can only scale and make "solid". Slepalex - I haven't noticed that the height map gets 8 bit if a PGM exported terrain is resized, or erosion added or drawn on it. 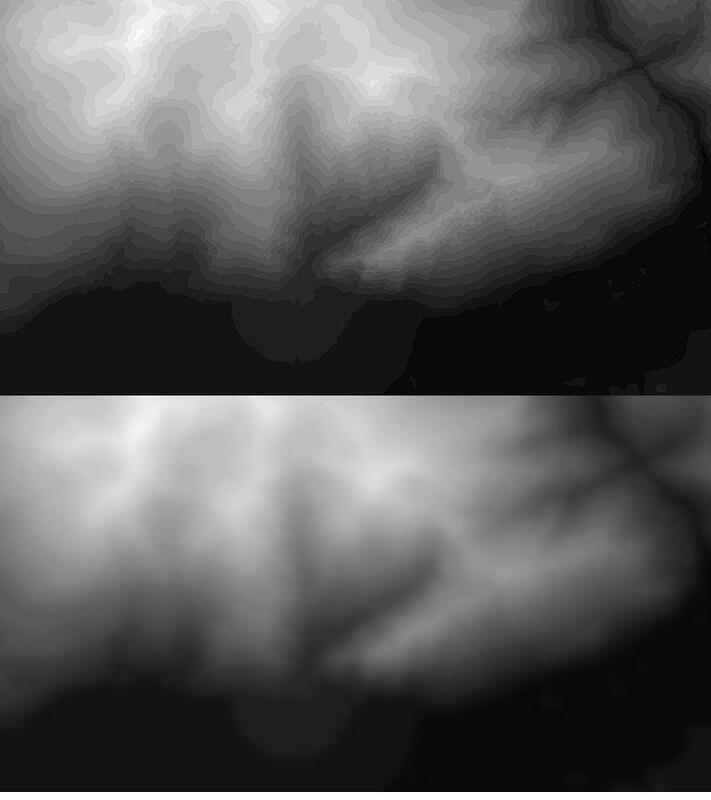 It can be exported as Heightmap 16-bit Greyscale (TIFF). Unfortunately, tag 258 has not 3 values so the header is wrong and Bryce cannot open it but Photoshop can and saving it corrects the bug. I usually either export as raw 32-bit - WorldCreator, Carrara and convert it in HDRShop to 16-bit grey or export as Raw (16 bit) for Carrara and just add a correct TIF header, for which I wrote a program. I learned this from my own experience. Ps. I have to apologize. My memory is failing me. Apparently, the steps appear in another case, I forgot in which. Apparently when copying and pasting images directly on the Pictures tab. Slepalex - thank you for the clarification. I checked several manipulations on the PGM terrain in the TE and they work fine. Horo - You're correct, GeoControl Demo version UI is a bit different than World Creator. I'm going to check out the World Creator overviews on Steam to get a better sense on how the software works. I do recall exporting a TIFF from WC but Bryce couldn't import it and the tag 258 error message came up. I'll see if GIMP has the ability to fix it. Thanks for the heads up. Slepalex - Thanks for suggesting GeoControl and for your input. Though World Machine is a powerful terrain generator, its preview window is just not adequate and I'm having to go back and forth for the full-screen view and the macro layout (F5 & F6 on the keyboard). GeoControl (World Creator) has a much larger preview window and better layout. "Tiff 16 bit greyscale (displacement, Vue proc.)". However, it cannot be loaded into the TE in any known manner. For Bryce is the format of PGM. You can also export a color height map in BMP, JPG, PNG format, which can be converted to shades of gray. And (this thought just came into my mind) a color height map can be converted to a texture in Photoshop, highlighting the corresponding colors and replacing them with a texture using a mask. Although ... this is not a good idea in terms of the huge size of the texture and memory space. But in some cases (for example, for the distant plan) it can be very useful. I am pretty excited about the next release which will be soon..hopefully within the year. There is a platform you can get invoved with called "Discord"--it reminds me a little of Steam-- that allows for interaction and forums, updates, etc of the WC progress and others' projects. Here is the latest announcement: "The Media Library has been finished today. You will be able to import textures, models and details. Models can be adjusted in LOD, distance view, billboard, scale, and you also can apply textures to each subset. So it is a highly flexible import for your own custom assets. The distribution also has been adapted to each Tab inside World Creator. We are now heading for the Object Placement feature - you will be able to place / rotate / scale individual objects but also directly paint the placing of each object (using brushes) on your terrain - no Areas needed for that operation. Think of it like painting tons of Plants easily directly on your terrain - of course we will support additional selectors during the paint operation. The entire system got extremely improved - thousand of plants in real-time. Also, we have added color variation possibilities which is very usefull for vegetation. You do not want to have plants with the default green spreaded on your terrain :wink: - that can be controlled for each submesh (e.g. bark, leaves ...). We are currently building up a nice plant package that will ship with World Creator." Do you know how I got these nice ridges? In an original way. 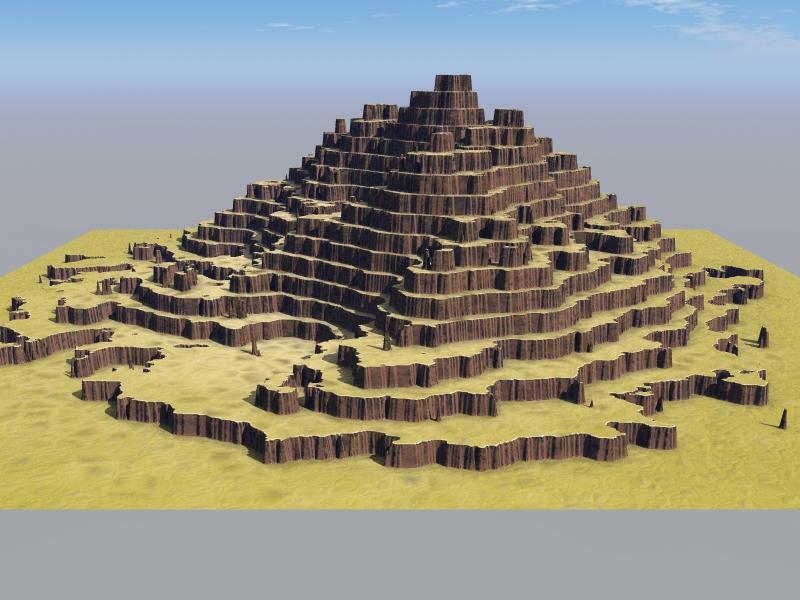 I put the pyramids of Bryce primitives in a certain way, so that they resemble mountain spurs. I adjusted their position in space, slope and size. Then made a render in the window with equal sides from the top view, using the "Altitude Mask". I saved the pictures, then I loaded it into TE and applied the "erosion" function (or maybe some other functions, I don’t remember). I passed the resulting elevation map through the filters in GeoControl2 and again loaded into TE. Sometimes you need to think outside the box. This is easier and more convincing than brushing in TE or Photoshop. Slepalex - well that's truly thinking out of the box. That's a very neat idea and the result looks great. Haha, Horo. "I worked almost a week just drawing the terrain". It's like scratching your left ear with your right hand. Here are the steps made in a couple of seconds in Bryce. Very well done and great thinking, Slepalex! Horo, and here is your favorite trick. We create terrain by default. Duplicate it. On the duplicate we use the "Posterize" function in TE. Increasing the duplicate by 6% on the X and Z axes. Here is your scree. Two terrain is a luxury. 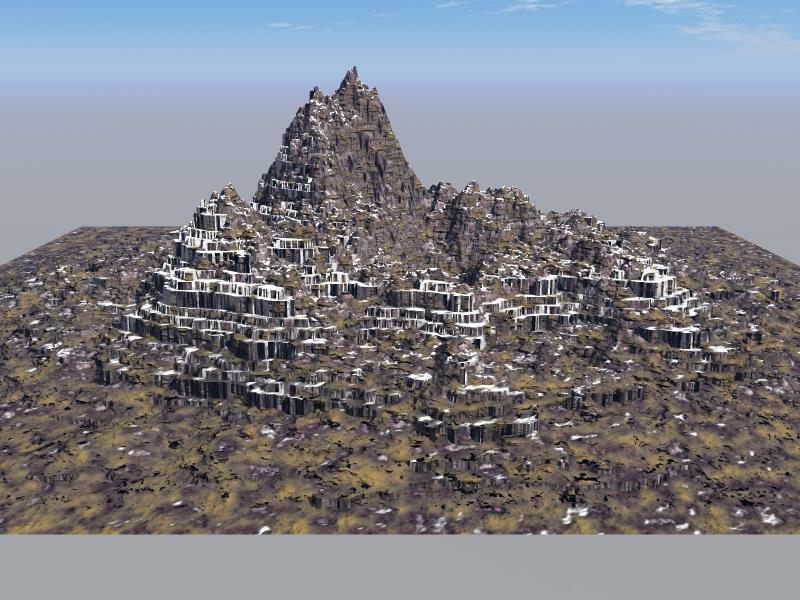 I would like to do this with one terrain in GeoControl2, but I don’t know how. I did not find any lessons on GeoControl2. Although you can try to mix two height maps in Photoshop in a certain way. There are too few opportunities for this in TE. Slepalex - I know that I can posterize a terrain in the TE. I took a map because I wanted to create a real existing terrain and I wanted no steps. 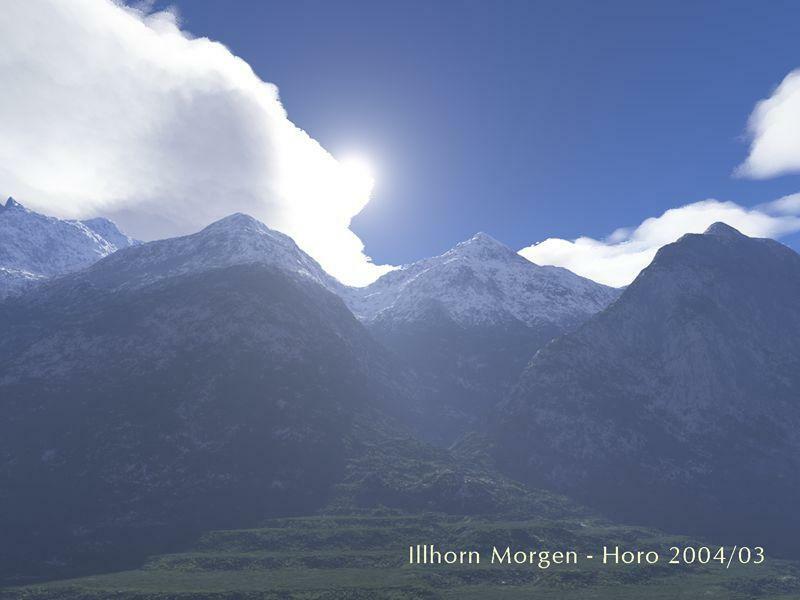 It is the view to south and shows the mountains Emshorn, Meschler, Illhorn and Gorwetsch. This is my view outside the window. There was no TerrainParty at the time where you could download height maps from everywhere in the world. Above the terrain drawn and below smoothed. 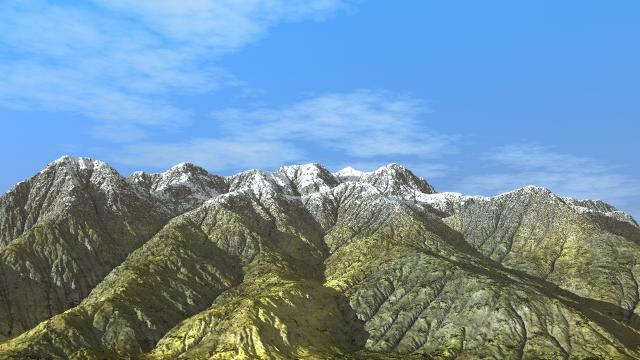 And this is the render made iwith Terragen at the time. You could of course, use the method you described above to take 2 terrains from Bryce and render a single Altitude Mask render from above and import the resulting render into Geocontrol to manipulate further. Or just bring back into Bryce as a single Greyscale... But that's a great effect and a great idea to layer terraced terrains with regular ones. Horo: Wow! a lot of work indeed to trace such high detail contour lines from a map and of such a large area. I remember in the olden days, people used to cut large thin sheets of polystyrene out to map contour lines and layer them to make 3D models of terrain. They would then papier mache the resulting stepped model and then paint it. 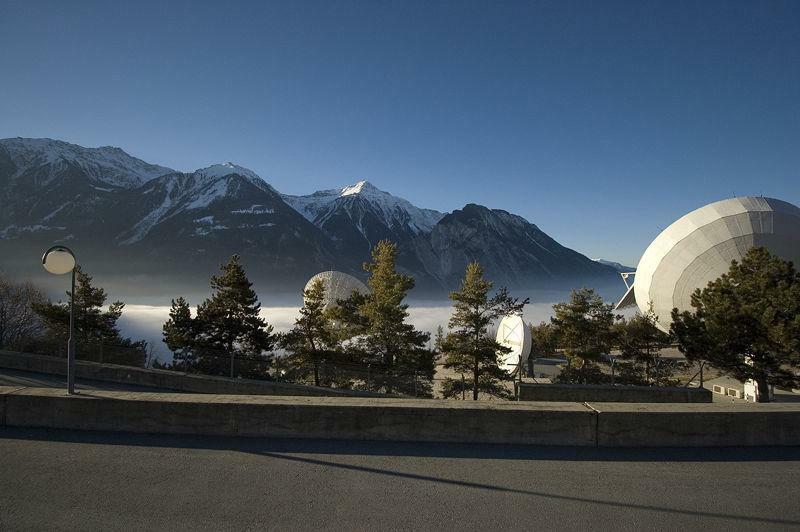 Here's the photograph of the mountain range. If there's a possibility to create it accurately in the Bryce TE, I don't know how. I remember this, but this method has its own difficulties. Although, I'll try right now. What stamina, Horo, to create such a detailed height map by hand! I gues you cannot recreate real life landscapes using Bryce (without e.g. Terrain Party). First of all, you would have to know the exact heights rather detailed and be able to 'paint' that in software. I guess, what you need is a helikopter and a top-down camera making heightmaps into grey-scale as Bryce uses. From what I have seen, World Creator gives you quite some options to precisely detail what you want to change where. This might bring you close (but no cigar, I think). I remember ten years ago I tried to create a landscape using contour lines in 3ds MAX. This is still a trouble! Here it is. Figure 1 is two folded terrain in the manner described above. 2. Map of heights "Altitude Mask". The fact is that the ground level for an unknown reason is not displayed in absolutely black color. Therefore, the foot of the mountain is elevated above ground level. I hinted at this problem above. I really like this terrain.. this is ripe for a Greek village waiting to happen! Rasberri - Congrats on getting World Creator 2; nice work & keep it up. Slepalex - Amazing brilliant and beautiful work. Horo - Absolutely incredible renders. I'm posting this image for those of us who have not yet tried GeoControl or have World Creator yet. The top terrain is a 2048 resolution Bryce generated Slickrock terrain. Once imported in GeoControl, I added Soft Fluvial, In-Thin Flows and In-High Sedimentation (default settings). Imported the PGM terrain back in Bryce and you can see the cool effects added on the second terrain. I still have a lot to learn but having fun.